At Akshara every programme has a definitive goal, a vision built in at the design stage, of children learning better and acquiring the foundational skills for academic progress. Our Research and Evaluation team enters the picture to gauge how programmes perform and whether end results have met the expectations on which they were founded. Data, children's test scores, classroom observations, teachers' feedback and field notes pass through fine scrutiny to convert into research papers on programmes and their effectiveness. It is stepping back and taking an objective, open-minded look at learning strategies, establishing successes, while pointing to shortfalls and areas for improvement. Behind the scenes are the quiet, back-room labours that support programmes - training, developing content and formulating assessment tools. The team plays a significant part in the nationwide canvas of ASER (Annual Status of Education Report) every year, anchoring its surveys, enquiries and learning assessments in Karnataka. Larger engagements such as advocacy, a push for reform in education, status reports to government with analysis and direction-markers, position papers, presentations and dissertations, are all work-in-progress for the Research and Evaluation team. Akshara Foundation, in collaboration with a faculty from IIT Gandhinagar with expertise in data analytics and education policy, undertook a research study on small schools and school consolidation. 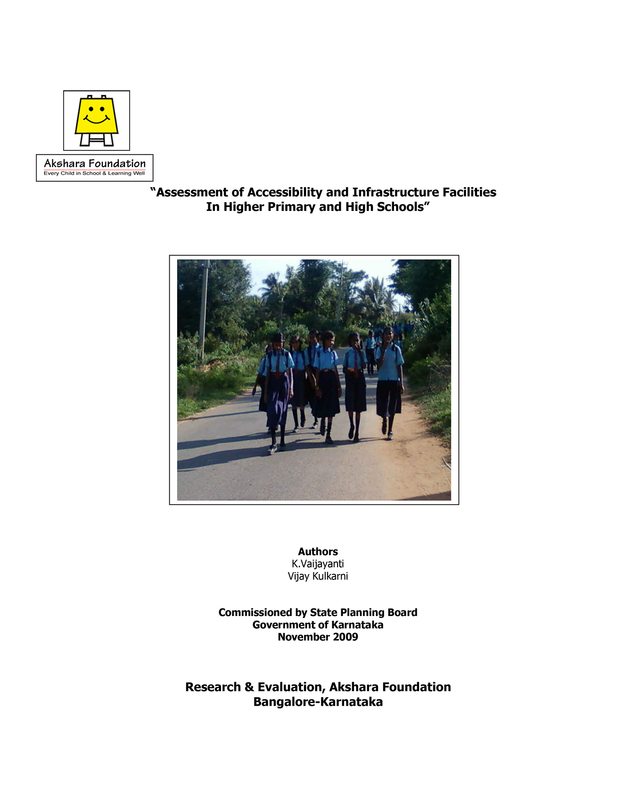 The study presented in this report is aimed at the issue of small schools in India and develops strategies to consolidate the existing schools to bring efficiency, provide vertical linkages, and to ensure adequate number of teachers per school and efficient distribution of infrastructural resources. The study discusses broader issues of school consolidation at the national level, with a special focus on Karnataka state, using secondary data from U-DISE and field studies by Akshara foundation at the local level. This report is a description of the Gram Panchayat (GP) Level Mathematics Contests organised for government school children in eight districts of Karnataka. It demonstrates the GP level math contests as a strategy to empower the community to take up quality issues in the public school system within the framework of participatory democracy. 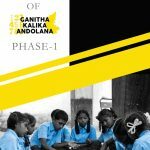 Akshara Foundation and Sarva Shiksha Abhiyan launched Ganitha Kalika Andolana (GKA) in the Hyderabad Karnataka Region with the key objective of improving the learning outcomes of children in grade 4 and 5 in math. This report is an analysis of the above mentioned objective using an Android-based App, which had test items built into it. Test tools were similar to ASER test tools; however there were some additional question to test other grade appropriate competencies. The baseline assessment for this initiative was the ASER 2014 score in math. The report is about what Classroom Libraries (NCF2005 compliant) and in turn books, mean to children. It includes the work that Akshara Foundation has done in the past decade with regard to providing access to books for children of government schools in three regions- Bangalore, Mundargi ( Gadag District) and Kushtagi ( Koppal District).It also focuses on Akshara’s interventions in the field, and the learning outcomes as a result of these libraries. Results show that children have shown positive gains in reading levels as far as the first language is concerned. The gains in second language competencies, though positive, do not appear to be very significant.The report includes a section on the positive feedback from a cross section of beneficiaries, like teachers, students and headmasters. 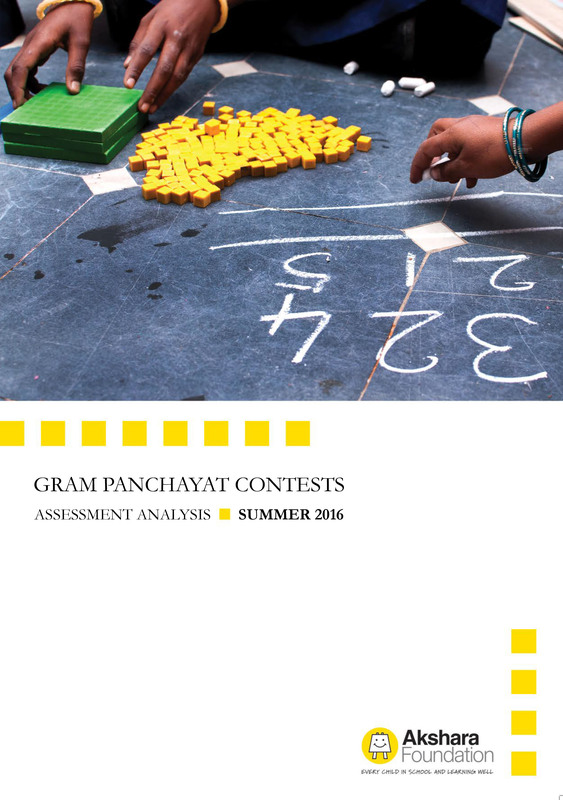 This is a report on Akshara’s new community initiative– the Gram Panchayat Math Contests. The Gram Panchayat (GP) Math contest is a first-of-its-kind community initiative in India involving all concerned stakeholders of the Gram Panchayats to push for the enhancement of the quality of teaching and learning of grade appropriate Mathematics. The results of each GP Math contest was shared with the GP and other stakeholders for their further action towards improving the quality of math education. This report talks about the Mathematics Teacher Contest that was conducted by Akshara and analysed the response to this contest. The effect of the Akshara’s Mathematics Teacher Contest in Kushtagi on the teachers has been promising as it created the necessary environment to think about the relevance of the Akshara Mathematics programme and related training. This is a study to elicit the participation of the School Development Monitoring Committees in promoting the educational achievement levels of students in selected schools of Hoskote and Kushtagi blocks in Karnataka. 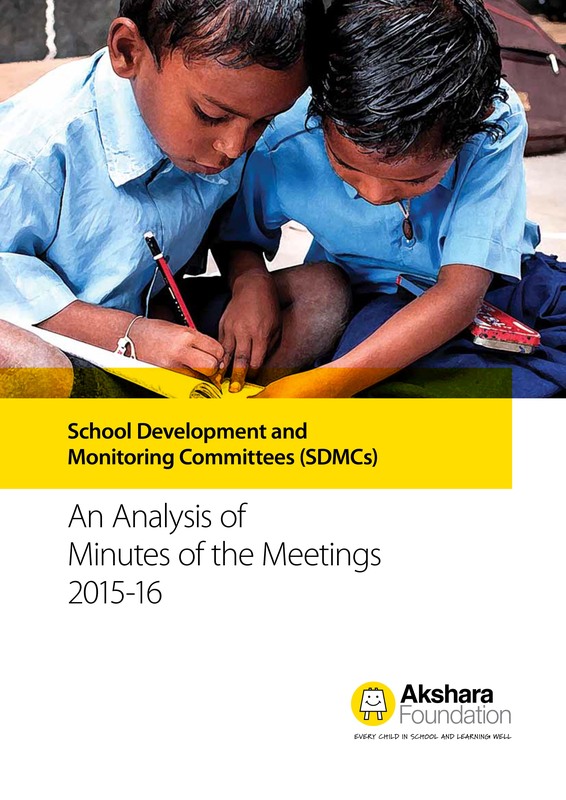 The minutes of the SDMC meetings are collected from the respective schools and are analysed to understand the patterns of SDMC participation in schools. More than a decade after the implementation of RTE Act (2009), formation of School Management Committees (SDMCs) have reached satisfactory level but their key functions remain highly inadequate in sampled schools in Hoskote, Mundargi and Koppal blocks. Empowerment of members and structural planning continues to be a challenge in the success of SDMCs. This research study was designed to test the hypothesis that Swalpa English Thumba Fun will impact the learning outcomes related to English among elementary school. The report outlines the findings of a longitudinal study conducted by Akshara Foundation in Karnataka. 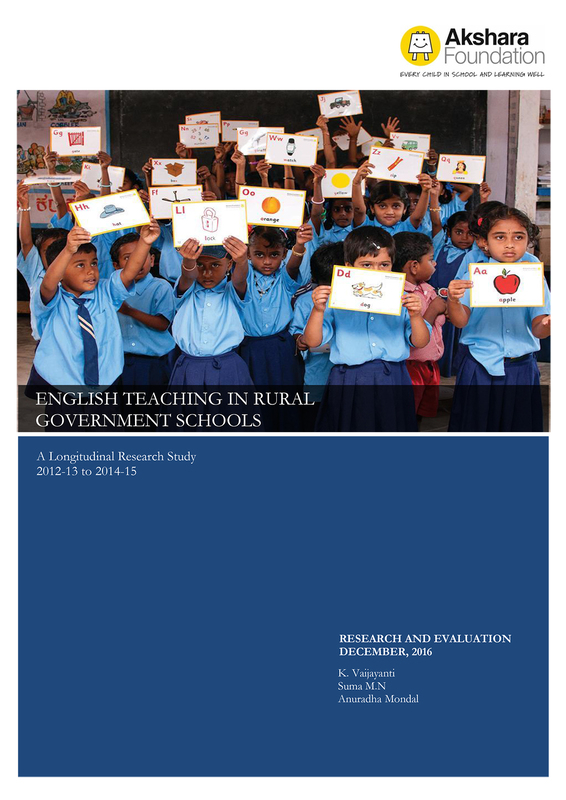 The study employed a controlled before-and-after design to compare the effectiveness of the English program on the learning outcomes of the elementary school children, the classroom practices, and teacher behavior in government schools. This research study was designed to test the hypothesis that Akshara Ganitha will impact the learning outcomes related to mathematics in primary schools. The report outlines the findings of a longitudinal study conducted by Akshara Foundation in Karnataka. The study employed a controlled before-and-after design to compare the effectiveness of the Math programme on the learning outcomes of the elementary school children, the classroom practices, and teacher behavior in government schools. 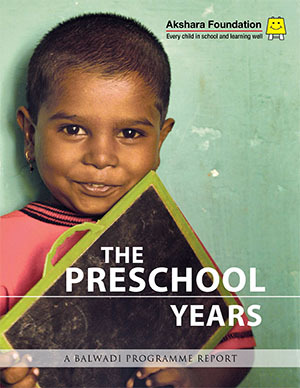 The report benchmarks Akshara’s pre-school engagement in the context of a theoretical best-case scenario. 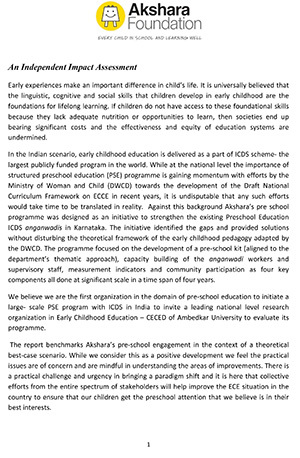 There is a practical challenge and urgency in bringing a paradigm shift and it is here that collective efforts from the entire spectrum of stakeholders will help improve the ECE situation in the country to ensure that our children get the preschool attention that we believe is in their best interests. 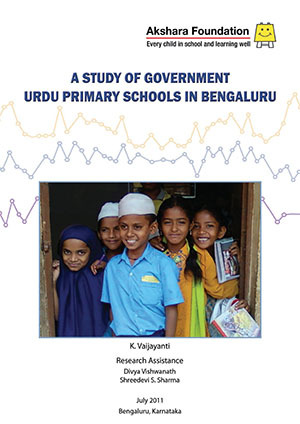 This study provides an overview of Urdu-medium primary schools in the Bengaluru Urban district of Karnataka in India. Akshara’s research examined access to government-run Urdu-medium schools and issues relating to enrolment, student attendance rates and learning achievement levels in these schools. Among the urban poor, the slum dwellers are the poorest. Akshara Foundation found that there are a number of children living in non notified slums and they have no access to any preschool education either through government centres or private centres. As a preliminary step in the process of setting up preschool (balwadi) centres, Akshara Foundation decided to conduct a feasibility study in Bangalore. This document is a Report Card for Hoskote Block South Karnataka for 2012-2013. The facts and figures have been collated by Akshara’s field teams over two years of work that covered the ground extensively through school surveys, classroom observations, teacher interviews and administering learning assessments. There is much that needs to get done, for which the community too must take onus. Access is no longer a concern for primary (lower) education in Karnataka. The focus should therefore turn to the functioning and facility-deficits at the upper primary and high school levels, which might hinder the continuation of education and the completion of the ten-year education cycle. 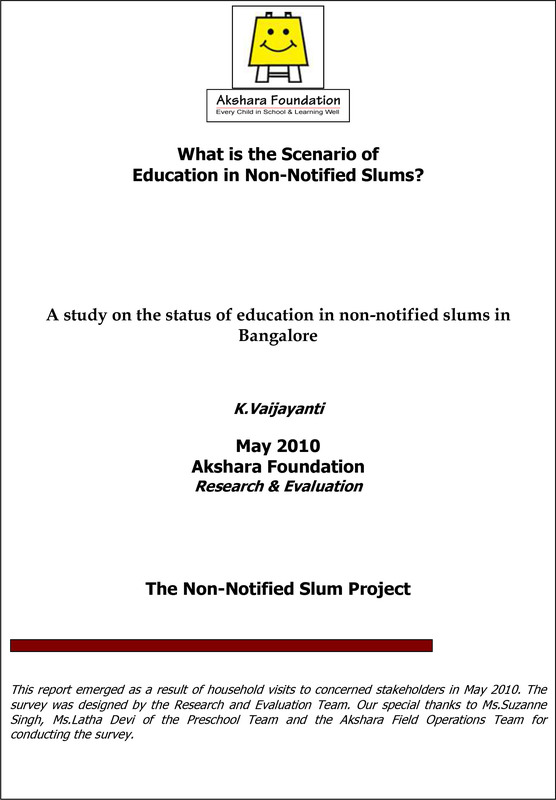 The study is about what happens to students of the villages which lack facilities beyond Std. V? What are the challenges that they face in commuting to schools outside the village? The report card offers a glimpse into the demography and the learning outcomes of children attending government preschools and primary schools in Bengaluru in the academic year 2009-2010. The results presented in the report are based on data collected by Akshara Foundation in government preschools and primary schools. The data covers learning outcomes in all major domains for ECE (Early Childhood Education) as well as Mathematics and English in primary schools. It is an undeniable fact that the first six years have a direct, decisive bearing on children’s lives. That is when minds develop and skills are acquired. The importance of early stimulation cannot be underestimated. While the importance of care for the young child is well understood, the reality is that the needs of millions of children in these crucial years are not met. The child under six is a largely deprived being in India. Government and civil society have a stupendous task before them. In the first phase, the Karnataka Learning Partnership has taken up the accelerated reading programme, so that all children in government primary schools in Bangalore are able to read fluently and accurately. The programme was a success. The results are there for all to see.